To help reinforce the idea of lab safety, this download is a domino-esque game where the student matches the beginning of the Lab Safety Rule with the ending. 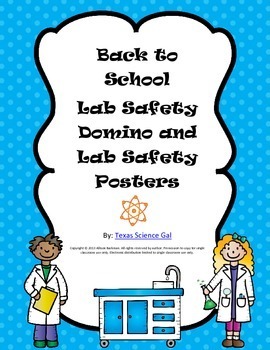 Simply cut them out, mix them up, and let the kids follow the colorful posters included to complete the domino. Included are 7 different dominos covering 6 rules and 6 different colorful posters with the clipart provided by the Clipartfactory. If you like the download don't forget to leave feedback and follow for new updates on freebies and other products!